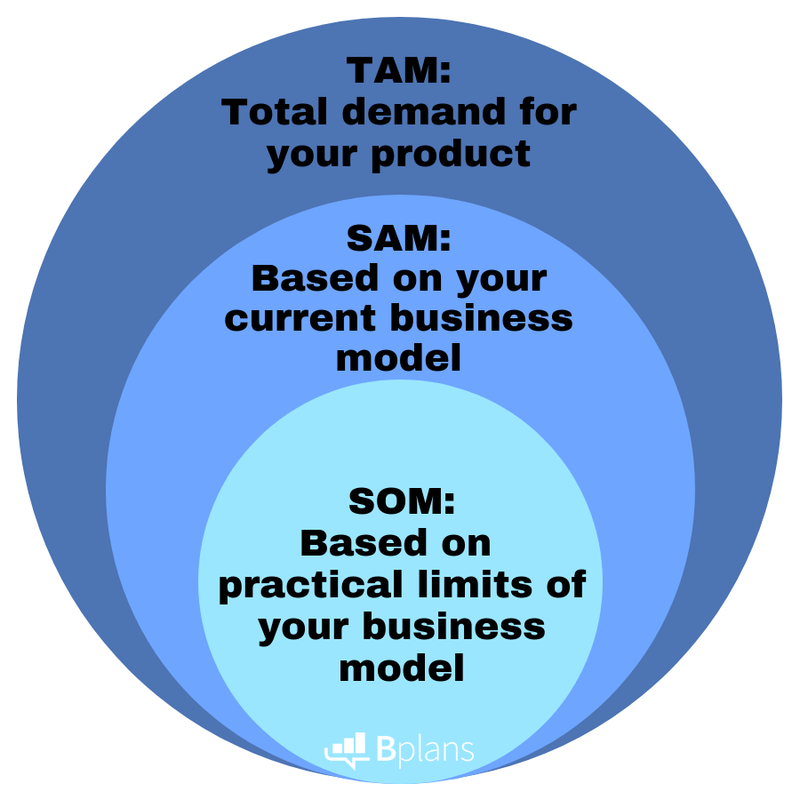 A common item missing from most plans is a breakdown of the company’s TAM, SAM, and SOM in the marketing section of their plan. Wondering what these acronyms mean? Well, you’re not alone—many entrepreneurs are not familiar with these terms. Here’s a quick explanation of what they mean, followed by an example. Having viewed several business plans over the years, a common (and very important) item missing from most plans is a breakdown of the company’s TAM, SAM, and SOM in the marketing section of their plan. Wondering what these acronyms mean? Well, you’re not alone—many entrepreneurs are not familiar with these terms. Identifying your TAM, SAM, and SOM requires some market research (levels of research vary depending on your product and market potential), but once you gather the research through your market analysis, you’ll have a better idea of the percentages that coincide with each area. Identifying your SOM, or your target market, is an important step because building a marketing plan around your TAM—in other words, everyone—is a huge waste of resources. Figuring out who exactly you think will actually buy your product will help you focus reach. You’re starting a concierge service in your city that focuses on doing tasks/running errands for busy people, and people who need additional assistance (the elderly, individuals who are handicapped, and so on). Your TAM (total available market) would be all busy people, elderly, and handicapped people in your city. If your town has 150,000 people, you may find (through market research) that total possible demand for your business in your city is 15 percent (or 22,500 people). Note: If you have a competitor in your market, your TAM would be smaller, since you will be sharing this market with another company. Your SAM (segmented addressable market) would be the portion of that 22,500 whom your current business model is targeting (this will be outlined in your business plan). For example, your business model is being set up to service 7,500 people a year who are ages 35 to 55, with small children and disposable income who live or work within a 2-mile radius of downtown, this means your SAM would be 33 percent of your TAM (or 5 percent of your total city’s population). Your SOM (share of the market) would be the portion of your SAM that your business model can currently realistically serve. For example, you may only have three employees (yourself and two others), so realistically what percentage of your SAM (7,500) can you reach in the first 2 to 3 years? Let’s assume your company can effectively provide concierge services to 100 people a month or 1200 people a year. This means your SOM is about 16 percent of your SAM (or around 5 percent of your TAM, or a little under 1 percent of your total city’s population). If you’re seeking funding, savvy investors will ask you for these items in your business plan, and they’ll want you to be able to back up your numbers. This is why conducting some market research up front is important—and even advisable before you begin writing your business plan. It gives you the validation of your market potential. Hopefully, this clears up a bit of the market reach acronym soup!